Linver Insights is a leading business solution provider specialing in high-end summits, trainings and third-party event planning in Asia Pacific region. We serve more than 10,000 professional executives from world leading corporations to help them gain deep insights of the latest industry polices and regulations, learn professional knowledge and skills to improve their decision making process. Moreover, we provide tailor-made business development programs and professional marketing promotion platforms upon customer's request. Listening to the heartbeat of customers’ needs, thinking out-of-the box for business innovation and integrating resources available are the pillars of our success. The association was established in Beijing 2003. The key missions of the CCREA are “Protecting the legal rights of its members, making advice when relevant government agencies are making policies, representing the industry to communicate with government agencies”. Its primary members are commercial real estates development enterprises, retailers, chain store companies, commercial consultant companies, designing companies, funds companies, devices suppliers and professionals. It has more than 400 members. 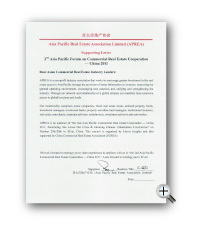 Such as Gome group, Wanda Group Share Co., Ltd, Shimao Group, Sunco China Holding Co., Ltd, China Merchants Property Development Co.,Ltd, Brilliance (Group) Co., Ltd, Ivanhoe Cambridge, Yum!Brands, Inc., Jones Lang Lasalle, Union Trust Co.,Ltd, Inter Continental Hotels Group, Times and Warner Co.,Ltd, Bestbuy, Fujits Lift Co.,Ltd have joined in CCREA. 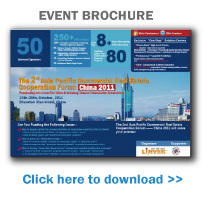 The members have abroad influence and they are representative in commercial property industry. CCREA keeps searching opportunities for international cooperation for promoting the internationalization of the industry. It organized the members to attend the annual meeting of ICSC in Las Vegas (USA) and MAPIC in Cannes (France). And it arranges the projects negotiation between the international investment banks (such as Goldman Sachs, Macquarie Bank, etc) and China commercial real estate development companies. CCREA also keeps good relationship with the embassy of America, Italy, Australia, Singapore and ICSC, Boao Forum for Asia and such international organizations. The Asia Pacific Real Estate Association (APREA) is a non-profit industry association that represents the real estate sector in Asia Pacific on a regional basis. APREA works to encourage greater investment in the real estate sector in the region through the provision of better information to investors, improving the general operating environment, encouraging best practices and generally unifying and strengthening the industry. econet china is a non-profit initiative coordinated by the building, energy and environmental departments of the German Industry and Commerce Greater China offices. Founded in 2007, PREXPRESS is the first newswire service provider, and the only public relations online solutions provider. PREXPRESS had provided online press releases Service for over 900 companies from all over the world. Got the joint venture by the world's largest media group--Omnicom Group (Omnicom) and China's largest communications group—SHUNYA Group in 2010. PREXPRESS have become the largest, the most executive and integrative professional local Press Release Service Provider. PR Newswire is the premier global provider of multimedia platforms that enable marketers, corporate communicators, sustainability officers, public affairs and investor relations officers to leverage content to engage with all their key audiences. Having pioneered the commercial news distribution industry 56 years ago, PR Newswire today provides end-to-end solutions to produce, optimize and target content - from rich media to online video to multimedia - and then distribute content and measure results across traditional, digital, mobile and social channels. Combining the world's largest multi-channel, multi-cultural content distribution and optimization network with comprehensive workflow tools and platforms, PR Newswire enables the world's enterprises to engage opportunity everywhere it exists. PR Newswire serves tens of thousands of clients from offices in the Americas, Europe, Middle East, Africa and the Asia-Pacific region, and is a United Business Media company. CBR (CEIBS Business Review) is a monthly publication on management hosted by China Europe International Business School. Featured with China Focus and global perspective, CBR provides the original business philosophy and improves executives’ competencies in thinking, decision-making and leadership. CBR links with 200,000 senior executives with advantage of the largest alumni network among Chinese b-schools and targets on the prime opinion leaders and business decision makers. FORTUNE China's editorial mission is to equip the senior managers of Chinese and international enterprises in China with world class management information, to assist their efforts to manage in an ever more competitive and extremely fast-changing environment. Editorial contents are drawn from the English edition of FORTUNE as well as local content written and edited specially for readers of FORTUNE China. FORTUNE China's award-winning design team blends global quality with local flavor, resulting in the best looking business magazine in China. Regular features include management ideas and solutions, profiles of successful management strategies at leading global and Chinese companies, trends in the impact of technology on managing business, IT trends and applications in managing, and coverage of important market trends from a top management perspective. FTChinese.com, the only Chinese online publication of the Financial Times, is positioned as a leading business and financial website, providing vital news, in-depth analysis, and thought-provoking comments to China's top businesspeople and decision-makers on every business day. FTChinese.com gives its readers unrivalled global perspectives combined with outstanding local expertise. The Financial Times’ international team of journalists and unrivalled access to senior corporate executives and politicians both in China and around the world, make it a must read for China’s business leaders. FTChinese.com has over 1.6 million registered users. Launched in January 2002, Chinese WSJ.com (http://cn.wsj.com) is The Wall Street Journal’s online publication for business and finance in Chinese. Positioned as Chinese language arm of Dow Jones global media, Chinese WSJ.com draws on the editorial resources of Dow Jones global news network, while addressing the needs of local subscribers through the efforts of a dedicated bilingual team. Chinese WSJ.com features the latest in international business and financial news, and is updated round-the-clock every international business day. Dow Jones & Company is a subsidiary of News Corporation. Dow Jones publishes the world’s most vital business and financial news and information. Its products include newspapers, magazines, newswires, indexes, radio, television programming and online services and publications. CNBC Asia Pacific is uniquely positioned to speak to viewers from across the region. Headquartered in Singapore, the network provides nine and a half hours of live Asia-produced programming, which is complemented with coverage of live market action from Europe and the US. CNBC Asia Pacific's channels, which include CNBC Asia, CNBC-TV18 (India), CNBC Pakistan, Nikkei-CNBC (Japan) are available in more than 21 countries across the Asia Pacific region. CNBC also has a strategic alliance with Shanghai Media Group, which wholly owns a subsidiary,China Business Network and a partnership with Digital Chosun, an entity of Chosun Daily Group of Companies, the premier multiplatform media conglomerate in Korea. The channels are distributed via satellite, cable and terrestrial broadcast networks, as well as broadband, on www.cnbc.com. CNBC content is also distributed on mobile platforms through selective markets. For more information, please visit us at www.asia.cnbc.com. CNBC is 100% owned and managed by NBC Universal, which is the broadcasting unit of GE, the ‘World’s Most Admired’ company in FORTUNE magazine's annual poll of executives (March 2007). 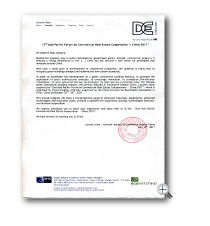 Interfax Business Wire Services provides a one-stop solution for companies seeking distribution and disclosure of press releases within and outside China. In association with Business Wire, a subsidiary of Berkshire Hathaway, Interfax News Services brings the most comprehensive distribution and disclosure network to China. We can deliver your releases around the globe in virtually every industry sector. RFP (Real Estate, Facilities, Projects) Magazine’s editions are the premier information resource for built environment issues in Asia Pacific. We provide up-to-date editorial content for Real Estate, Facilities and Project Professionals as well as interested members of the wider business community and general public. Since 2004, RFP Magazines have been the title of choice for the key people who invest, design, build and operate commercial buildings across Asia. It has become recognised as the knowledge leader on issues such as green building, sustainable development, workplace strategy, and building technology and known as an “insider” when it comes to commercial real estate transactions and movements across the region. China PRnews operates a full-text news announcements distribution service to assist Chinese organizations and companies, public and private, in delivering news releases to targeted financial and general media, as well as marketmakers and the general public. China PRnews aims at providing a state-of-the-art platform of information distribution and PR-related services. NetEase.com, Inc. is a leading China-based Internet technology company that pioneered the development of applications, services and other technologies for the Internet in China. NetEase’s online communities and personalized premium services have established a large and stable user base for the NetEase websites which are operated by its affiliates. In particular, NetEase provides online game services to Internet users through the in-house development or licensing of massively multi-player online role-playing games (MMORPGs), including Fantasy Westward Journey, Westward Journey Online II, Westward Journey Online III, Tianxia II and Datang, as well as the licensed game, Blizzard Entertainment’s World of Warcraft®. Eastmoney.com, the most-frequent-visited and most influential financial & economic media in China, the first web portal of A-share market (Stock Code 300059，listed in March 2010). Within the seven core channel: homepage, Daily Fund, Stock, Quotations, Stock Bar, Finance and Caimi-micro blog, Eastmoney.com provides authoritative, in-depth media insight and multivariant, effective interactive methods， which satisfies the demand of financial and economic information of users and becomes the first choice of investors. Gathering the largest investment groups consist of intellectual elites in China, Eastmoney.com always endeavour to become the most popular website and the information provider for all the financial investors. Archina (archina.com),as a leading Internet media platform of construction industry in China, providing efficient, convenient, and professional full-service for architects ,managers of design companies, and real estate developers. Archina focuses on hot fields in construction industry, such as real estate development, landscape, interior, material, green building and so on. Latest information in construction industry and deep reports are the most important feature of Archina. That is why archina.com now is a portal in construction industry with the highest hits.Archina.com now is run by Archina limited, which also runs Archina Weekly, architects club and ACMC (architecture communication media center). Real Estate Investment China（www.fdctz.net）is the first Professional website in China to provide real estate investment and related financing information services.We has a strong sense of mission, is committed to using the Internet platform, strengthen the real estate investment in china.We provide information exchange and sharing, so as to promote the development of real estate investment in China. e.Activities of our investors Club. a.real estate investment and financing business, commercial banks, trust companies, private equity funds. b.a real estate investment and financing needs of real estate enterprise. c.real estate finance industry's elite, who are interested in real estate finance industry, the community. ChinaValue.Net is the biggest online professional community in China that with more than 600,000 registered members, promoting and leveraging a knowledge-based economy in China and moving beyond a labor-intensive base. As noted in the LSE feature article, ChinaValue is a “professional, social, media network, where members exchange information, knowledge, and business know-how.” It’s also the single biggest source of market, investment, and business trends intelligence in China and the largest community for professionals to collaborate and support their career growth. Unique to China is the historical drive for public recognition through quality scholarship and writings. The professional CV blog portal enables this need and thus supporting its long-term continued growth. CV differentiates itself from other blogs by having its elite experts identify themselves by real name in their submissions producing select professional content; using an open and dynamic writer/participative ownership model where the writers or Researcher/Analysts (RAs) increase their ownership value by the number and quality of their submissions and their ability to attract other elite bus-econ (business/economic) experts; a bonus revenue sharing program based upon the same criteria; and interviews with the top bus-econ experts. Online content is outstripping traditional media (newspapers, magazines, television) and content2.0 are the revolution leading this change with more than 60% of internet users in 2008 obtaining the bulk of their information online. This makes CV the largest source for premium business, economic, and financial intelligence, analysis (BEFIA) information and a growing source of “targeted” eyes for advertiser content. 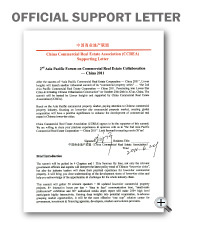 CV is the “keystone” or hub of a bus-econ information ecosystem sharing value with the professional experts and RAs through the open share system, and CV is the top source of current China-focused BEFIA information worldwide. Launched by the Shanghai Haobai Infotech Corporation Ltd., with the support of the strong team of retail and commercial real-estate professionals, topretailing.com has become one of the top vertical portals in the retailing and commercial real-estate sectors in China. The skyrocketing number of visits for the past two years contributed to the obviously felt extensive impact exerted on the industry as well as relevant mainstream media. While interfacing timely with the overseas as well as the capital market, we provide most up-to-date top industry new, analysis and research papers while expressing our "views" and "thoughts" by proper means. 1998, Founded as "Archinfo.com.cn"(now obsolete). 2000, Zhulong Weiye Technology Co. Ltd. established and domain name "Zhulong.com" registered. 2002, Website renamed as "Zhulong Wang". We work to build an technical service and communication platform for architects and engineers, and help them deliver their projects. As our mission, we work to build a service and communication platform for professionals from the construction industry. Zhulong.com's business scope is determined by the actual requirements of our customers, too. 31 Events Network is the professional and convenient web platform for organizers to do one-stop network release, promotion and interaction. It offers various tools and services, like events release, promotion, interaction, management, micro-blog interaction and marketing, registration reminding, online vote and survey, etc. By these, the organizers will find the efficiency improved to 48 times as before (Comparison: Manpower and time needed in the same event to reach the same effect). The work of event operation team, department cooperation, and event process will be dramatically simplified and optimized.